This is the kind of painting that I really get off on. Wonderfully naive and direct in style with a unique charm all of its own; but check out the subject matter. Starting with the indecipherable signature it represents a whole trail of unanswered questions. 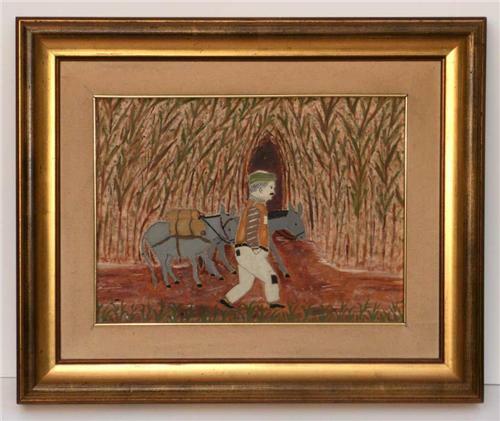 Who's the dude leading the donkey; what are they carrying; is that a cane field or a corn field; and (it is obviously not set locally) what country does it depict? The answers are out there somewhere; but I'm not sure that I wouldn't prefer to live with the enigma. At some stage this work has obviously meant a lot to someone; evidenced by the elaborate and expensive frame. The age attribution is my best guess.